Thinking of taking an adult only vacation without your kids is a big step for many families. It’s scary to think about leaving your kids with someone else, and how much you will miss them while you are away. 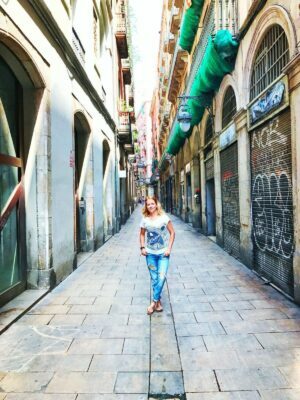 We love to travel WITH our kids (obviously, since I started this blog!) BUT traveling WITHOUT our kids or “kid-free vacations” as we call them, is something that we try to do at least once a year. When I talk to my mom friends about vacationing without kids I hear a lot of “we would love to, BUT…” I know it’s hard, I know there might not always be the ideal babysitter, I know you will miss them A LOT but this is one of those things that just doesn’t happen unless you MAKE IT HAPPEN. If you are thinking of taking the plunge, I hope this post encourages you to make it happen! 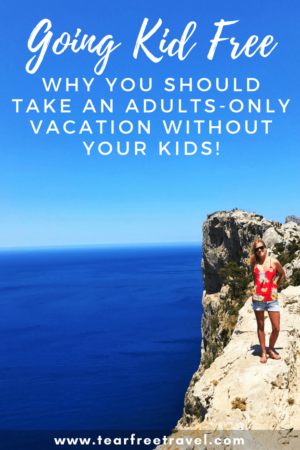 Here is my list of the reasons you should ABSOLUTELY take an adult only vacation without kids! On our last kid-free vacation we left our young kids with the grandparents. Both kids were so excited, they barely noticed we left. Yes, I think they were spoiled the whole time, and yes, I think they ate all sweets but it was only a week and when we returned it was simple to get them back on their regular routine. My parents, on the other hand, are still recuperating from the week-long duties several months later. ???????????? My mother kept on repeating “This sure is a young person’s job!” the whole week we were gone. If grandparents aren’t an option, think outside of the box! I have a friend who doesn’t have family close by and her and another friend who is in a similar situation take each other’s kids for a few days a year. The kids are already friends, so it’s really a win-win for both sides! You might be surprised to realize that some of your mom friends would love to ‘trade-off kids’ for a few days or a week a year in exchange for the same favor! It’s good for them too! I remember myself going to sleep away camp every year as a young kid. Those first few days I was a mess! I am so glad now that my parents pushed me to stay and learn to be away from them! Those times ‘on my own’ are some of my best memories as a kid! I might read a book WITHOUT interruption on this beach! You will reconnect with your partner! I don’t know about you, but the first basically 3 years of becoming a parent are almost entirely a blur. From not sleeping, being a human milk machine, then being pregnant for the second time, and finally the terrible twos (and threes!) my husband and I were in survival mode. Going away helped us reconnect and love each other as a couple again. It’s easy to get caught up in being “mom” and “dad” but so important that we also still be “wife” and “husband.” We got to enjoy quiet dinners, drink wine and laugh about what our lives have become. You can drink your morning coffee while it’s still hot! It is the little things in life that make you happy, and seriously this one is high up on my list. Every morning I make my morning tea and every morning it’s cold by the time I get to it. Drinking tea while it’s still hot is quite possibly the best thing about going on vacation ‘kid-free’. Oh, and reading a magazine on a plane! Seriously when was the last time you did that? Now plane rides are the stuff my nightmares are made out of! I read an ENTIRE magazine on the plane on my last kid-free trip. It was pure bliss! I know no more about Angelina and the Kardashians than I have had a chance to know in the past 3 years!!! Sleeping in, eating out, doing whatever you want!! The best part about our time away from the kids was being able to sleep in! My kids are early risers and I AM NOT! Being able to sleep in, even until 8 am was the most glorious thing! Make sure you go somewhere with a comfortable bed and blackout curtains, it is heaven!! As a side note, stay tuned for an upcoming post about why you should ALSO take a vacation without your kids AND without your husband. Having the bed all to yourself with no kicking and no snoring might even be better than drinking coffee when it’s hot! ha! Of course, everyone has different ideas about what makes the perfect vacation without your kids. This resort is pure heaven. There is a beautiful beach, gorgeous pool, and AWESOME spa facilities. The water circuit area is amazing! The food here is also out of this world! It is way better than a typical all-inclusive resort. We loved everything about this resort and will definitely be back! I love the style and luxury of this Vegas resort. The location is great with easy access to shopping and shows. Vegas is great for a quick getaway without leaving the US. I keep a price alert on Skyscanner as there are often great deals throughout the year. New York is definitely my all-time favorite city. I spent one summer as a college student giving tours here and absolutely fell in love with what the city has to offer. There is so much to do from great dining, shopping, and entertainment. Lately, I’ve been preferring to stay in AirBnBs when I head to New York as I find I get more of a ‘local feel’ this way. 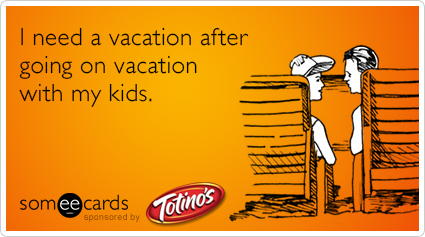 Have you been on a kid-free vacation you loved? How was your first time leaving your kids? Drop me a line in the comments below to let me know your experience.